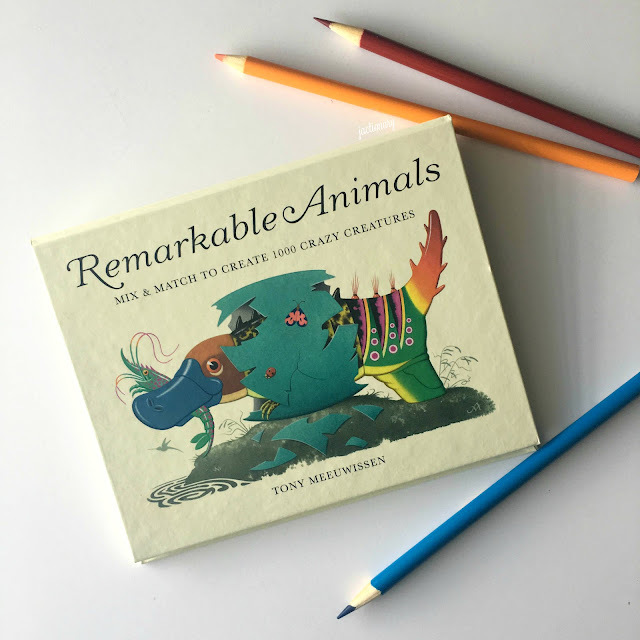 Remarkable Animals is a children's interactive picture book, well-suited to preschool and Kindergarten readers. First published in London in 1997, the book is in print once again. Author and illustrator Tony Meeuwissen has been creating art for fifty years and his work has been recognized with the Victoria & Albert Museum award for illustration and four awards from the Designers and Art Directors Association. In Remarkable Animals, children are first presented with a whismical yet real-world animal and a comical but informative description. 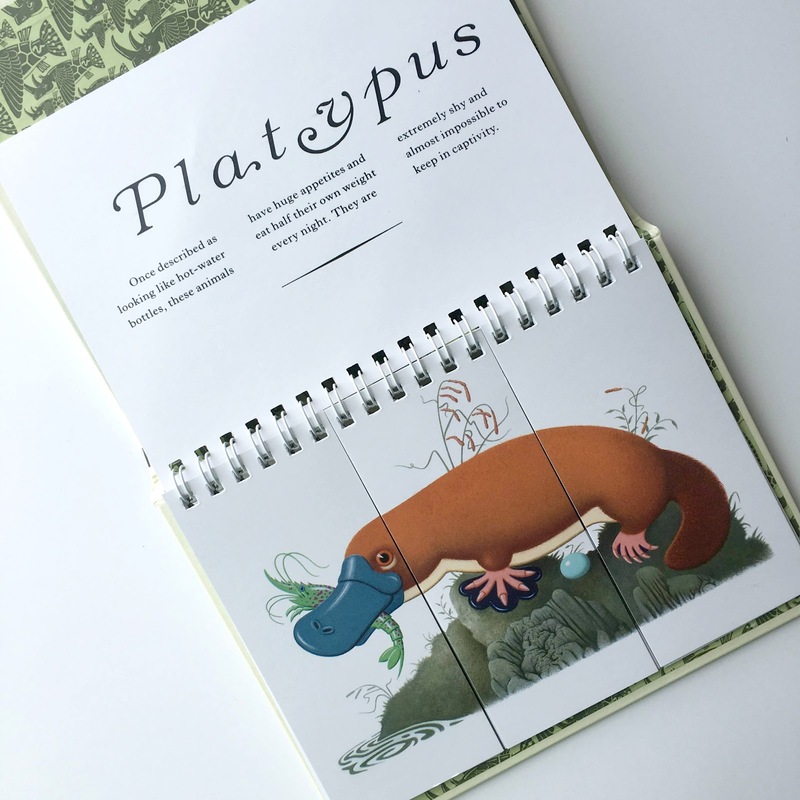 For example, "Platypus: Once describe as looking like hot-water bottles, these animals have huge appetites and eat half their own weight every night. They are extremely shy and almost impossible to keep in captivity." Beneath each name and description is a three-paneled illustration. 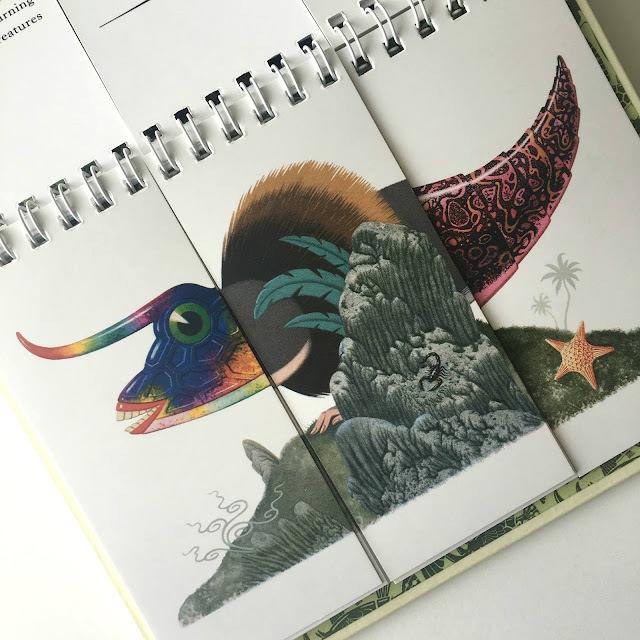 As children begin turning the book's pages, they can either flip a set altogether and meet a new creature (like the Trunkfish) or turn select panels at a time and create a new animal and description all their own. Some of my own creations resulted in the "Beevitor," a "Gatigan," and an "Allossul." Switching and playing with the flippable page segments is silly and fun and made me want to set things straight again so I could see what these animals were originally. Readers don't only have fun, but they can learn a few things too. I learned about the mohoohoo (an African white rhinoceros that can gallop thirty miles an hour) and the ruby-topaz (a South American hummingbird). The illustrations are bright and colorful and mixing and matching the ten animals is a fun activity for animal-loving picture book aged readers. My only complaint is the book's thinness: if you're good at algebra you can figure out that just ten different animals with three different panels can soon become the hundreds promised in the title. I wish Meeuwissen had included several dozen pages and made the book much thicker, providing more opportunities to mix and match.